Now that you have completed this eCourse series, are you ready to get serious about starting on on-line internet business? If so, don't forget to check out Sitesell Services, the company that helped me build my website. You can Purchase SBI! 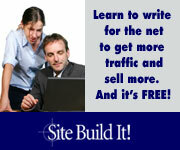 (Sitesell's top of the line site building tools), educate yourself using their tutorials and build the site yourself. Everything is provided for you, but you do all the work. 12 weeks, you will have built your website with the instructor's guidance. You can hire Sitesell to Build The Site For You with your guidance. You are more of a consultant in the process. I chose the first option when I built my site. I knew absolutely nothing about starting an internet business yet after purchasing SBI! and following their very detailed instructional guides and videos, I was able to build my website. Hopefully you have enjoyed these ebooks and will consider using Sitesell as your source going forward. You will not be sorry.